Beginning in 1983 we have been providing our customers with the best-quality products, competitive pricing, and personal service. Our customers enjoy our fresh approach to meat, produce and deli with a variety of choices. 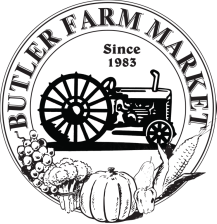 Butler Farm Market lets the customer choose each item because we don't prepackage our products, as you can see from out photos section. When in season, we concentrate on buying fresh produce from local suppliers. We take enormous pride in our products and the personal experience that we provide and hope that you will find something in our store that you will enjoy. Have a special request? Call and let us know.